Super Duper! is the highly acclaimed program that allows you to easily create bootable backups. The straight forward user interface makes it easy for novice to professional to automatically create a cloned backup of your computer. The main methods to automatically backup your Macintosh are via Apple’s Time Machine or manually via a software program. Time Machine is the simplest method, allowing you to select a disk for your backup and schedule the backup without requiring any other effort. However, this backup is not bootable which means if your computer crashes you may need to spend hours restoring from Time Machine. This will get your computer back to the state it was at the last Time Machine backup. SuperDuper! creates a bootable clone of your computer on an external drive that you can boot from to immediately get you back to the state it was at the last time you backed up. Both methods have their advantages. There’s no reason not to do both. The SuperDuper! user’s guide addresses common uses for the program. To back up your Macintosh for the first time you will need an external drive. This can be accomplished via a network drive or, preferably, a FireWire or USB 3 drive. One caveat is that USB 2.0 and not all Firewire drives can operate as a Macintosh startup drive. The recommended Firewire drives are from Other World Computing, WiebeTech, LaCie or Maxtor OneTouch. Note that if the drive has files on it, they may be overwritten by the backup. SuperDuper! behavior can be defined by the During copy section of Options. 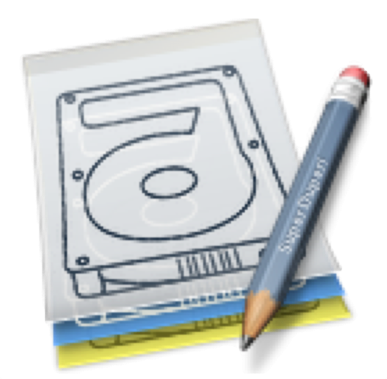 In this case you may want to partition the drive with Disk Utility to isolate your backup from other storage. However dedicated backups are always better than partitioned volumes. Once you have sorted out your hardware environment, it’s time to start SuperDuper! and choose your source and destination volumes. You have the option to back up to an internal drive, external drive, or an image file stored locally or on a network volume. In addition, you can copy to another computer in FireWire Target Disk Mode. This is accomplished by powering the computer while holding down the T key. It will connect to your computer like an external FireWire drive. The next step is to choose your backup script. SuperDuper! has two different backup scripts, Backup – all files and Backup – user files. The Backup – all files creates a bootable clone if the source is a boot volume. Backup – user files does not create a bootable backup. It backs up specific files in the Home directories of the accounts on the system. There are other default scripts, namely, Sandbox – shared users and applications and Sandbox – shared users which are used to create a bootable copy of your system that can be stored on another hard drive or partition sharing your personal documents and data. 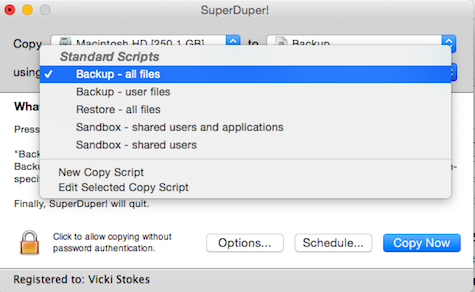 Now that you have your backup volume, source and destination, and backup script selected, you have the option to tell SuperDuper! how to perform the backup. Click Option. The Before copy options occur before the main copy operation occurs. The During copy options control how the Copy Script processes the files selected for copying. On successful completion options run at the very end of a successful copy. There is also an Advanced tab which allows you to customize your backups. These options are self-explanatory. SuperDuper! gives you the opportunity to verify your previous selections in the What’s going to happen? section. You should review this section to ensure you don’t accidentally write to the wrong volume or back up the wrong data. If you are certain your selections are correct, select Copy Now or Schedule to schedule a later time for the backup. That’s it! Depending on how much data needs to be backed up, it may take hours or days for the backup to complete. However, you’ve instructed SuperDuper! on how to perform the backup and it handles the rest. Now that you have a clone of your system. You should try testing it out. Simply plug in the external drive. 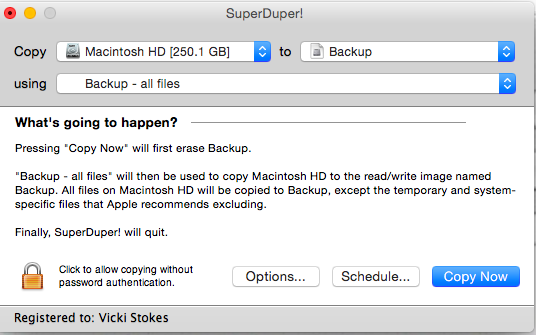 Go to System Preferences, select StartupDisk, then select your external backup, press Restart. If you system has crashed you will need to plug in the external drive, and hold the Option key on your keyboard during startup. You should then be able to select the backup drive as the start up volume. 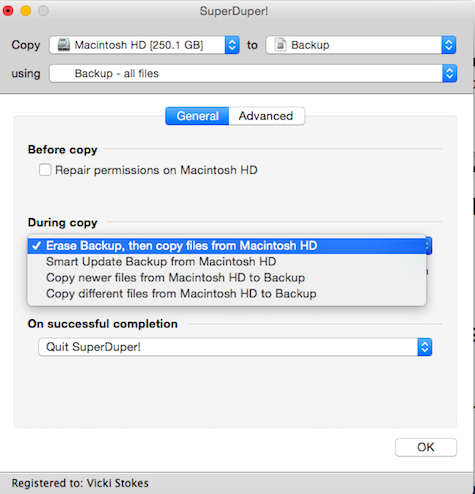 Creating a bootable backup of your computer is simple using SuperDuper!. At the price of $27.95 plus the cost of an external drive it’s hard not to justify this purchase. I’m at a loss to find any reason not to purchase this product. Piece of mind is priceless.